Nonstop Magazine 25 – Send Flix! Send flix for Nonstop 25! office@nonstopmagazine.ch oder auf CD, Stick o.Ä. an Nonstop Magazine, Postfach 509, 3000 Bern 7. Wir freuen uns auf Euren Stuff, vielen Dank für die Unterstützung! office@nonstopmagazine.ch or to Nonstop Magazine, Postfach 509, 3000 Bern 7. We’re looking forward to seeing your flix, thanks for your support! ON THE RUN has produced the CALLIGRAFFITI FLOWPEN MARKER, developped together with SHOE, who’s book CALLIGRAFFITI was released some months ago. Nonstop 25 – out now! Out now – Nonstop 25! The 25th issue of Nonstop Culture Magazine is out now and already available here. Get it soon in your local graffiti shop! Out Now – Nonstop 24! The new issue of Nonstop Culture Magazine arrived hot off the press! The 24th issue is devoted to Swiss graffiti. Nonstop 24 – Send Flix! Open publication – Free publishing News from Barcelona! Enjoy the preview of Goodfellas Magazine’s forth issue! FC Barcelona stars Messi, Keita and Piqué show with some Montana Cans that they stand against racism! Video about Los Angeles graffiti legend Revok of the MSK crew. Ghetto Art is a great new book documenting the German Capital’s trainwriting scene. Doku auf ARTE über Hiphop, Breakdance & Graffiti in den 80ern. Nice video clip from Ewok (USA) and Does (Netherlands) who meet up with Nash (Netherlands) to rock a wall in Split, Croatia. Exit Through The Gift Shop – the first motion picture from the English street art phantom BANKSY is finally available on DVD. Be sure to check it out! RAFFOMAT is entering the market with a new state of the art graffiti supply vending machine! Die Hall of Fame in Ostermundigen bei Bern ist gefallen! The long expected movie from Valencia’s ROYALS crew is finally released and will be available soon! The book “Rockin it Suckers – New York City’s Most Wanted Graffiti Vandals” is the inside story of the RIS crew from New York City. The 10 Year Anniversary Edition of Style Time Jam, 23. Oktober 2010 @ Hangar Ostermundigen / Bern. “The Wall Call – Graffiti Styles and Letters for the Gallery” exhibition feat. DEREK, AMIK, KAM, KESY ONE, TRAP TWO HON, ZONK and AVE UNO in Aarau. 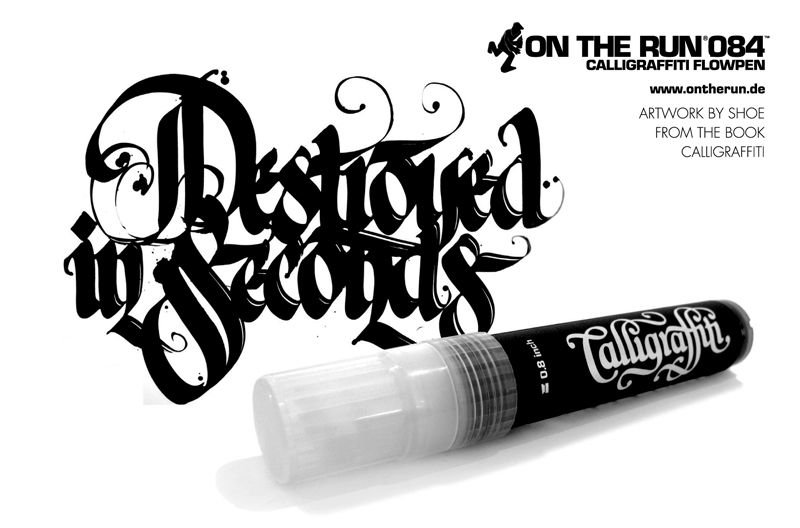 ON THE RUN x SHOE present the Calligraffiti Flowpen Marker! Part 3 of the Spanish Graffiti movie is coming soon! The Exchange live in Morges, with Serval, Poet, Bates and Rime! Swiss rap legend at MOS in Zürich.